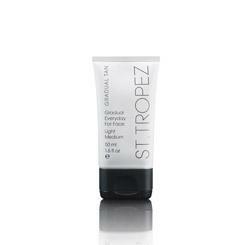 This wonderfully light, easily absorbed facial moisturiser cleverly combines serious skin care benefits with a touch of self tan. Infused with soothing aloe vera and antioxidant Vitamin E which will help to gradually build a golden colour everyday. Our innovative Aromaguard™ fragrance technology eliminates the tell-tale self tan aroma by a minimum of 70% and instead gives a beautiful subtle, yet refreshing fragrance.